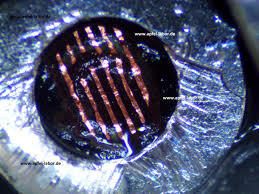 Home » Blog » Microsoldering, Motherboard Repairs » Repairs » Long Screw Damage – Are You a Victim? Long Screw Damage – Are You a Victim? Long screw damage can happen to anyone. A few days ago you decided to finally take a crack at fixing your own iPhone, you look up some handy guides online, watch a couple of youtube videos then hit ebay for the parts. A few days later (weeks or months probably, thanks ebay) the package comes and you sit down at the kitchen table and spread everything out lovingly knolling (the process of arranging items you need out into a space before using them, its a thing, trust us) all of the parts and tools you will need. You pull a guide up on your tablet and set to work, after a few hours of minor frustration, you snap the housing back together and everything’s fine except that worrying crunch you heard when you pressed the screen in, but its probably fine, right? When you power the device on you see a long line streaking dead straight down the screen, or perhaps an area of the screen is not working as intended or it may not even come on at all, what you might be dealing with is long screw damage. In most phones, there are many screws and each one is dedicated very specifically to its own little home and it rarely is interchangeable with any other home, so mixing up those screws can be fatal to the part you were trying to replace or even fatal to the phone itself. The next step is to make sure you’ve not damaged the mainboard itself that houses all those precious chips. First up, try to do a soft reset on your phone by holding the home key and power button, or volume down and power, or some combination of these you can readily find on the internet for your particular device, simultaneously for about 15-20 seconds, if you now see the phones logo and the phone starts normally then you are good to go. Next, disconnect and reconnect the battery, this can sometimes fix a stuck software loop or hard shutdown that won’t restart. 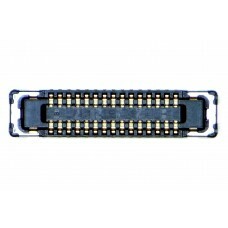 If this fails, the next step takes it up a notch, get some isopropyl alchohol, avoid swigging to relieve your own stress at this point, and using a static free cloth or brush, clean around the FPC connectors which are the connectors that attach the cables from the screen assembly, to the logic/motherboard. If none of the above has helped or you aren’t willing to take the risky step of using liquids on your favourite electronics, we recommend bringing it into us at A One Mobiles and Repairs for an expert opinion and solution. The long and the short of it (punt fully intended) is that you may have fitted a screw that is just a millimeter too long and drilled down into the board, underneath which lies electrical tracer paths that communicate with your screen. This is called long screw damage and will need micro soldering under a microscope so it can be re-wired where the break in the lines are damaged. The image below shows the gaps that have been created by the screw being forced on it. If You have tried these steps to resolve your problem but nothing has worked then we at A One Mobiles & Repairs can organise to have this fixed.